Few things are as thoroughly British as The Great British Bake Off, and indeed the title indicates as such. It’s not hard to see why it’s become such a sensation among the public, and we here at Silke are big fans of the show. Big enough that we’re only to happy to share our knowledge of some of the secrets behind it. Namely, some of the appliances used in the production of the show. The first, and one of the main motivators behind the article, is the kind of oven the show uses, which we just so happen to have in stock; the Neff Slide & Hide Built In Oven. Many viewers have picked up on the titular Slide & Hide function, making the oven a fairly in-demand item. We’ve briefly covered it before, but as a reminder; the Slide & Hide function is a revolutionary door design that slides underneath the oven, rather then opening out in front of it. This greatly reduces the risk of accidental burning, and could save space in a typical kitchen environment. That Neff ovens are also loaded with functionality is an additional bonus, as they can be used to bake, roast, or cook anything you could possibly want to. Another Neff product used on the set of The Great British Bake Off is the Neff Warming Drawer. Primarily designed for warming plates, it can also be used to keep food warm. In fact, the Neff Warming Drawer is capable of keeping food warm for up to 6 hours! 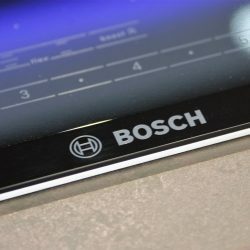 One of the most exciting appliances used in The Great British Bake Off are the Bosch Induction Hobs. Induction Hobs are a favourite of ours, entirely for the functionality they provide. With Induction Technology, the heat is instantaneous, and only the bottom of any pan set atop it will be heated. This means that things heat up faster, and none of that heat is wasted during the cooking process. They’re also much safer, as they will only heat pans made of ferromagnetic metal, rather then the surface of the hob itself. Add in how intuitively Induction Hobs control, and they’re a real no-brainer purchase. We love that even with the retro styling of some of their other appliances, such as the Gorenje Retro Freestanding Champagne Fridge Freezer or Smeg’s FAB30LFA 50’s Retro Style Fridge Freezer, The Great British Bake Off is as dedicated to the use of ultra modern technology in the kitchen as we are. It just goes to show that age old traditions and cutting edge appliances really do go hand in hand!